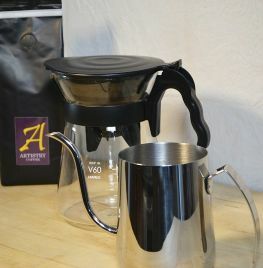 The Drip-Filter Kit combines a simple, yet elegant pour-over coffee device and serving vessel all in one. 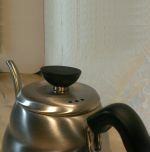 There's also an effective pour-over kettle for accurate pouring. Perfect on your breakfast table to get you going in the morning! Just add a paper filter, some ground coffee and away you go. This kit has everything you need for a perfect pour-over coffee, with a serving vessel suitable for when a few friends are round. Now featuring stainless steel lid too! 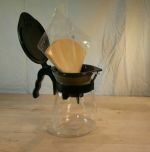 Upgrade to a Hario Buono kettle?